Dedicated to Wallpaper. Digital Printing Gets Involved in Wallpaper. Wallpaper manufacturers enjoy the benefits of digital printing. They create limited runs at a cost-effective price, as well as provide the option for one design to be output in multiple colorways. While many printers are available for printing wallpaper, several digital printers are specifically designed as dedicated wallpaper printers. Before digital printing was available, conventional wallpaper technologies were used—and still are today. These include screenprinting, flexographic, traditional block printing, surface printing, and gravure. Gravure involves submerging engraved steel rollers into ink. After rotating onto a blade to remove excess ink, the steel roller transfers what’s left of the ink in the engraved cells onto the substrate. “While capable of beautiful effects, gravure printing has its disadvantages. For example, printing on textured substrates is challenging and only large batches make up for the cost of the custom-engraved steel rollers. Also, gravure limits wallpaper designer creativity as the pattern must repeat every 64 centimeters,” explains Van Gaever. “We mainly see flexographic and rotary screenprinting in use in conventional wallpaper production today. This is because digital print is not near the speed needed for mass production of wallpaper. Typical line speeds in use are 60 to 70 meters per minute. 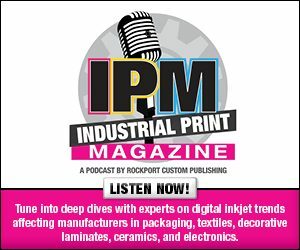 Typical print width is 1.2 meters wide,” shares John Corrall, managing director, Industrial Inkjet Ltd. The availability of digital changes the wallpaper industry in multiple ways. Specifically, it creates an opportunity for more affordable options. This in turn expands the customer demographic, with perspective buyers purchasing for corporate offices and retail spaces to homeowners looking for wallpaper in a toddler’s bedroom and millennials requesting something unique and different. Wittenberg believes that given the versatility of digital, it also provides a nice breadth of different wallpaper media—smooth, textured, magnetic, foil, or Type II—that adds variety and character to homes, restaurants, hospitals, and offices. It is also important to note that unlike conventional technologies—specifically gravure—digitally printed patterns do not have to repeat, says Van Gaever. Furthermore, the design can be sent straight to the operator, with no custom hardware necessary. Types of ink used for digitally printed wallpaper include water based, eco-solvent, latex, and UV. Ink must be considered in the overall wallpaper production process because of where the paper resides and how often it will be in close proximity to humans. Emissions from the printing process can pose a potential risk. Vendors offer creative solutions. “Odor can be an issue with solvent/eco-solvent, and to an extent, UV inks. The rise in popularity of HP’s latex ink is due, in part, to the fact that it is completely odorless, features excellent scratch resistance and durability, and comes off the printer fully dried so it can be shipped the same day,” explains Wittenberg. Xeikon’s electrophotographic printers apply electrostatic charge and heat to dry toner and the substrate. As a result, the toner is fused to the paper and emits no volatile organic compounds. Containing no solvents or hazardous substances, prints are odorless and safe to dispose of. The toners comply with the European Standard EN 15102, an international safety standard for wallcoverings in public places, in terms of reaction to fire, release of formaldehyde, vinyl chloride monomer or heavy metals, sound absorption, and thermal resistance. “There are some tough EU regulations that wallpaper must meet, for example EN 15102:2007+A1:2011. These cover emissions from the wallpaper, migration, and wash and rub resistance. For example a small child could lick the bedroom wallpaper,” agrees Corrall. Digital printing is a viable solution for the production of wallpaper. While its current sweet spot is shorter runs and one offs, technology is advancing to influence mass production. The second part in this series looks at specific dedicated digital wallpaper printers. Click here to read part two of this exclusive online series, Features Ideal for Printing Wallpaper.